She left and nobody took her place. Maybe she was still hungry? That's the difference between government and private industry in a nutshell. Now that government is installing intself as the gatekeeper for healthcare, just try to get in to see your doctor. If it is hard now, wait until the government is in control. Has government ever made anything better? You simply won't be able to get to see your doctor for regular visits, so maybe you will go once a year if you are lucky. Maybe, just maybe, you will be able to be seen once a year. Your money won't mean anything because the government will eventually be the single payer. You will not be able to pay your doctor anything extra because that would not be fair. The government cannot even add and subtract. They can't tell the difference between a positive impact and a negative impact. Or, maybe they just lie about things because they think we are dumb. Or... maybe all of the above. Consider the Obamacare funding. Over $600 Billion was taken from Medicare, which is funded by payroll taxes taken from working people so that when they get old enough, they get "free" healthcare. The $600 Billion was put into Obamacare, which is not Medicare. In other words Obama stole $600 billion from Medicare to pay the healthcare of those who do not work and do not qualify for Medicare. Is that why you pay into Medicare--- so the government can take it away and give it tothe needy who did not contribute? Who said they could do that? Our lawmakers in the 111th Congress did that. Don;t worry, because they cannot add or subtract or tell positive from negative, we can say they did not mean to bankrupt Medicare to help Obamacare. What was the government's answer to the charges that they hurt Medicare? They claim they enhanced and preserved it for the long haul. SO, they stole your Medicare funds from the treasury and said it was a positive thing for you and me and all seniors? They can;t add. They can;t subtract. They can;t tell positive from negative, and we give them Healthcare to manage for us. Are we nuts? Since they took the $600 Billion from Medicare, they will now be able to put out their life-limiting regulations encouraging us to die soon to save the country. That ladies and gentlemen is what is known as healthcare rationing and you can bet that your friendly government has that in mind after they get the $600 billion into the government treasury along with the money that you or your employer today pay for healthcare. But first they must control the market, and the Obamacare bill is exactly what the government doctor ordered. While you read this, they are filling the prescription that puts them in control. That means that you are not in control -- even though it is your health, not theirs. When they take over, you can kiss your health good-by. What good doctor that you know wants to work for the governemnt? You and I and doctors know that government is incompetent. 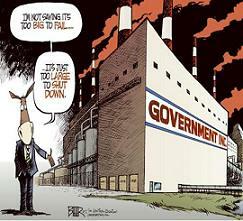 And, big government is incompetent in even bigger ways. Before Obamacare passed, the people had control and the government hated that. Now that the government is almost in control, after a short settling period, YOU, a person who always had the right insurance, will have your premium directed to help somebody else take your healthcare. Once that happens, you will be taxed the amount of your premium. You just won;t get any real health insurance YOU will be begging for healthcare forever. The government now has just about all all it needs to make you beg for service. The Republicans repealed Obamacare but the corrupt Senate, including Senator Robert P. Casey voted it down. So, in a short while it will be here. You and I will pay with our health, and the doctors we once knew will be retired on a tropical island someplace, pleased they do not work for the government. Why is Obamacare so important to Obama? It has given him and his government control of 1/6 or more of the economy, considering the education piece that they threw in to control who gets to go to College. That is a lot of power and this is the biggest power grab in US history. That's what it is all about. Obama wants all the power, and he thinks Americans are such big suckers, we will vote him back in 2012? Obama knows that the W.C. Fields philosophy is to never give a sucker an even break and never smarten up a chump. Don't expect the truth from Barry Soetoro andy time soon. He already has his playbook open and he is beginning to scare everybody that Medicare and SS will be gone and any program for women and children will be eliminated since the Republicans hate women and children. Hopefully Americans will see the folly in beleiving such nonsense from the Charlatan in Chief. One less Obama as President and America can be brought back from bankruptcy to being a great country again. Don't be a sucker and don't be a chump. Don't worship Obama. Instead, for the sake of America, work hard to defeat him in 2012, along with his buddy Robert P. Casey Jr. US Government is so intrusive into all our lives that it is nothing short of tyranny. Call it what it is. Words once reserved to describe the acts of dictators now describe the spew coming from our government. These words include tyranny, socialism, respect for special interests, and corporatism. Each and every one of these notions threatens our Republic. I am so sick of it, I wrote five books about it. Recently, I admit, I have been smitten by the cogent thought and heady writings of Ron Paul. In the last few weeks as I have been trying to figure out what I am all about, having had Alan Keyes as an Internet mentor, I have been impressed by the deep thought and the logical solutions proposed by Doctor Ron Paul. (MD) I never knew he was an MD and I like MDs. They are intrinsically good in my opinion. So recently I have listened more intensely to the words of Ron Paul, a doctor, and an impressive person. We can quip all we want about government service being an oxymoron, and it is. However, if all we do is joke about it and do nothing to replace the rascals that made it this way, then shame on us. Make sure you vote and make sure you vote out those who have made America weak, and who have nor respect for our liberty. They want the biggest government your tax money can buy and they don;t care a thing about you. Throw the bums out! The sooner the better!